The 28.83 metre motor yacht Soho has been listed for sale by Simon Goldsworthy at Edmiston & Company. Built in GRP by Italian yard Falcon Yachts to a design by Stefano Righini, Soho was delivered in 2008 as a Falcon 90 model and has since been upgraded annually, most recently in winter 2017/2018. RINA classed and MCA compliant, accommodation is for eight guests in four cabins laid out as a master suite, VIP suite and two twins. All guest cabins have entertainment centres, television screens and en suite bathroom facilities while a further two twin cabins sleep four crew aboard this yacht for sale. Overall, she has a bright and airy interior with light wood and neutral tones throughout. An expansive saloon has comfortable pale cream leather settees grouped in a U-shaped configuration, a 60-inch television screen and an entertainment system featuring a Kaleidescape on-demand audio and video server. The dining area has a wine cellar and seating for eight guests around a large extendable table. A large aft deck offers al fresco dining and entertaining while up on the sun deck is a barbecue grill, built-in seating and ample sun loungers. 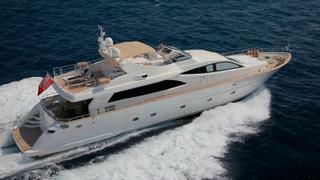 Her top speed is 28 knots and her power comes from two 2,250hp MTU 16V2000M91 diesel engines. For added comfort, she is fitted with Trac zero speed stabilisers. Lying in Barcelona, Spain, Soho is asking €1,200,000 with VAT paid.